Lavandula intermedia is a hybrid of true Lavender (Lavandula angustifolia) and spike Lavender (Lavandula latifolia). (It is often referred to as Lavender Grosso.) For this reason it has many of the benefits of true Lavender, but is higher in camphor which increases its antimicrobial properties, and makes it very useful for aches, pains, skin irritation, and acne. It has a deeper, more camphor-like, woody aroma and has fewer sweet floral notes when compared to Lavender angustifolia. 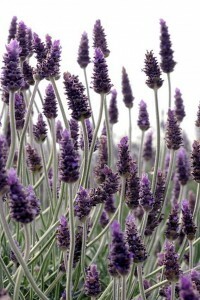 It is said that Lavender (Lavandin) also has a stimulating edge to it, acting as a tonic to the nervous system. It is said that Lavandula intermedia, used aromatically and topically, is energizing and restoring. Lavender may also help restore vitality to people suffering from nervous exhaustion. It repels insects and soothes bites, stings, and skin irritations. It has wonderful antibacterial, antifungal, antiseptic, and astringent properties. Lavandula intermedia Essential Oil can be used neat (undiluted), however for use on people who are younger or frail it should be diluted before use.